Hindus have continuously venerated the divine in female form – very often referred to simply as the Goddess – since time immemorial. The Goddess, often referred to as Devi ('The Shining One) in Sanskrit literature, is a manifestation of Shakti, the Supreme Power responsible for the creation of the world. 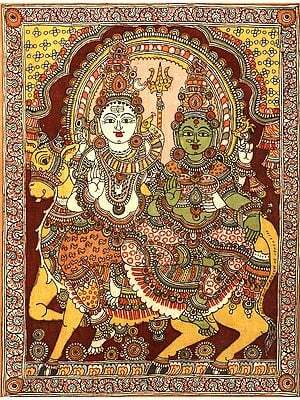 Hindu Paintings glorify the goddess in many forms. As a beneficent deity, she is widely venerated as Shri or Lakshmi. In her iconography Goddess Lakshmi is always shown in association with lotuses. Often two elephants may be seen bathing her with sacred waters. This form is known as Gajalakshmi. 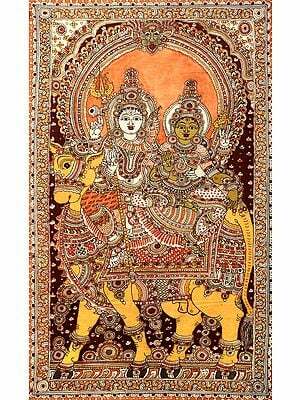 Devi Lakshmi is the wife of Lord Vishnu, and the two of them together are often the subject of Indian paintings. As Goddess Kali, the Devi is dark, disheveled, and awe-inspiring, with a necklace of skulls. Even in this form, she is called “mother” by her devotees, since after destroying this world she renews it again as the Supreme Shakti. Mother Kali and her ten manifestations of wisdom (Mahavidyas), form a popular theme in Indian Art. As a warrior goddess, she is Durga depicted with a smiling countenance but wielding an array of weapons. Durga, riding a tiger or lion, is one of the most popular goddesses in India. Strong and beautiful the weapons in her hand show her readiness to assist her devotees. In one celebrated story, she manifests herself with the energies of all other deities in order to combat a buffalo-demon, Mahishasura. She emerges victorious after nine nights of struggle, commemorated by the festival of Navaratri (“Nine Nights”) in the fall. The combat of Goddess Durga with the buffalo demon is one of the most dynamic episodes in Hindu Painting. As Goddess Saraswati, Devi is the patron deity of music, literaure and knowledge. She is associated with a swan or sometimes a peacock. Her typical symbol is the stringed musical instrument held in two of her hands.